If you ever wondered if too much candy-flavoured soda could possibly be a bad thing, well, it appears so. An Insane Clown Posse fan is suing the band's Violent J and a venue in Fargo, ND after allegedly being hit with an unopened two-litre bottle of Faygo, the unofficial soft drink of the Juggalos (see video below). The offending bottle of soda was thrown by Violent J (real name Joseph Bruce) into a teeming crowd of Juggalos at a 2007 ICP show, In Forum News reports, striking audience member John Antonelli and fracturing a bone near his right eye. Antonelli is now looking for at least $50,000 in damages in the lawsuit, which also names the Fargo venue as a defendant. If you're unfamiliar with the ways of ICP and their Juggalo followers, the inexpensive U.S. soft drink Faygo is regularly sprayed over audiences at the band's shows, as well as apparently over the mammaries of Juggalos' female counterparts, Juggalettes. But by the looks of things in this case, ICP opted to throw a whole bottle out into the crowd rather than go the traditional spray route. The Fargo case does not mark the first time ICP have run into trouble with the law. 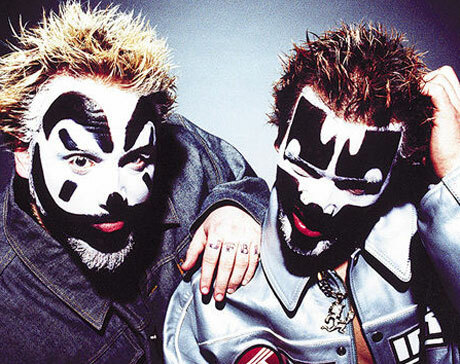 Both members were fined $200 in 1998 after getting into an altercation with a customer at a Waffle House restaurant in Indiana, and in 1997 Violent J reportedly hit a concertgoer 30 times with his microphone during a New Mexico show. Antonelli's lawsuit is to go to court by July 1.